There was the Puffin Club. The Puffin magazine. Puffin events, with Webb cajoling authors into attending tea parties to meet their readers, or spiriting children off to the island of Lundy to meet real live Puffins. Webb’s first pony book publication in 1964 was another Carnegie winner: Mary Treadgold’s wartime adventure, We Couldn’t Leave Dinah, won in 1941. It set the scene for a collection of horse stories that did not follow the conventional pony book trope of girl gets pony and wins every gymkhana event within spitting distance. Caroline dreams of a golden summer of ponies and the Pony Club, but that’s not what she gets. What she gets is war, and invasion, and a rapid reassessment of the world she thinks she knows, and the people in it. And Dinah, the pony, is indeed left. 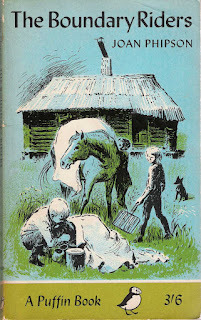 Webb found stories of Australian children where horses are set against an everyday life that is harsh and sometimes brutal (Mary Elwyn Patchett’s The Brumby (1964), its 1972 sequel, Come Home, Brumby, and Joan Phipson’s The Boundary Riders (1964)). She went to America for William Corbin’s excellent The Horse in the House (1969), a combination of coming of age story, lightly drawn romance (anathema for the conventional pony story) and a brilliant picture of grief and plain, goofy, teenagerdom. It was one of my absolute favourites as a child, and I can still remember where the book lived in our local library. It was the Puffin edition, which the library had converted into a hardback, leaving it a lumpier version of its original self, but one that stood up to the many, many times I took the book out. 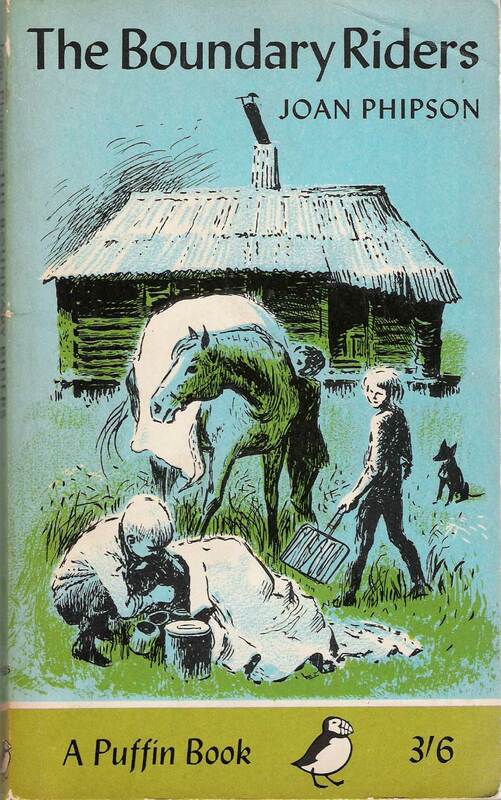 Swedish author, Gunnel Linde, wrote A Pony in the Luggage (1972), where two children who smuggle a pony up into their hotel room manage to keep this large and inconvenient visitor a secret from their disapproving aunt. The comfortable, middle-class girls who inhabit most pony fiction were given short shrift by Kaye Webb. Her horse story heroes, were, in the main, at the opposite end of the social spectrum. They struggled against far more than the fact they did not have a pony. She published the story of Kizzy, a Romany, in Rumer Godden’s The Diddakoi (1975), and visited Catherine Cookson’s North-Eastern landscape of mines and rag and bone men in The Nipper (1973) and Joe and the Gladiator (1971). The heroine of Rumer Godden’s Mr McFadden’s Hallowe’en will never be able to afford her own pony, and Florence Hightower’s family, in Dark Horse of Woodfield (1973) might once have been wealthy, but are now experiencing a dramatically different way of life in the American Depression. Eilis Dillon’s The Island of Horses (1976) gave the reader warring communities and a life lived against a background of unforgiving nature. 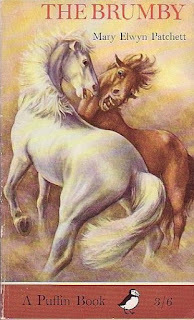 Irene Makin’s Ponies in the Attic, 1973, is about the tensions between a child who has lost the middle-class dream, and one who still has it. Even where the background is rather more conventional, the story is not. Ponies Plot (1967), by C Northcote Parkinson, subverts the pony genre completely. It is the ponies who are in charge here, and it is the ponies whose dream is to find a child of their very own. The pony is also allowed a say, if not so directly, in James Aldridge’s Ride a Wild Pony (1976), a judgement of Solomon in equine form, in which the disputed pony is allowed to choose its owner. Lucy Rees’ Pippa, in The Wild Pony (1978) comes closest of all to the pony book dream when she moves with her family to Wales. Like many other pony book heroines, the move to the country means the possibility of a pony, if only she will work for it. Pippa does, but the pony she buys is wild and difficult, and Pippa’s life spirals into misunderstanding and tragedy. Puffin Books took off in a major way under Kaye Webb. I can still recognise from 20 paces the spine of a Webb-era Puffin paperback, and know that I am guaranteed to get an intelligent and interesting read even though I am now several decades too old for the Puffin Club. Kaye Webb avoided the predictability and the shallows of genre fiction, but was astute enough to recognise that any genre can contain its gems, and that every child, no matter what their taste for fiction, deserves the very best. And that was what she gave them. I've read quite a number of those, although the only one I still have as a Puffin edition would be The Brumby. My copies of Ponies Plot and We Couldn't Leave Dinah have been replaced by hardcover. I remember being scared by We Couldn't Leave Dinah the first time I read it. While the war had been over for almost twenty years, it was still a fairly frequent topic of conversation amongst the adults I knew. One thing I liked about the Puffin books is that they generally had a higher quality binding than budget conscious imprints like Armada. Most of my Puffins from the 1950s and 1960s are still in one piece, which is more than can be said of other paperbacks of that era. Yes, the Puffin books do seem pretty solid! I still have 1970s Narnia Puffins and they're all absolutely fine. Did you leave off re-reading Dinah for a while after your childhood experience? There is an argument that experiencing fear through children's books enables you to cope with it, but I'm not sure if that's so! "Ride a Wild Pony" is an amazing book. I only heard of it here in the US because I belonged to a book club (World Famous Horse Story LIbrary) and they sent a hardcover version of this book under the title "A Sporting Proposition." Disney made a movie version of the story that is actually very, very good--no snarky obsservations or crude jokes meant to amuse the adults and be "cool" for kids. Just a straightforward honestly told story. I didn't re-read it for some years. It wasn't because I remained scared of it - I just didn't own a copy. It was a library book that I read the first time. I didn't read it again until I was in my forties, when I found a somewhat scruffy Puffin copy going cheap. I replaced it with an early edition hardcover with dust jacket a couple of years ago. I like it well enough now, but I really wouldn't classify it as a pony book. I tend to think of it as more of a war story, closer to something like Ian Serrailier's The Silver Sword than it is to anything by authors such as the Pullein-Thompson sisters. Coincidentally, that one was also published by Puffin. I think my Dad may have traumatized me a bit by those old war movies he used to watch. Not that they were that graphic or anything - they were mostly 1950s vintage. I can remember my younger sister and I diving behind the couch when the scary bits came on, and to this day I can get a bit of a jolt when I see a searchlight or hear the sound of an air raid siren. Seems a bit silly when you consider that I didn't even live through it. Ride a Wild Pony is actually one I intend on picking up at some point. It is a little later than most of my books, which were mostly published prior to 1970 (with a few exceptions like the Jinny books), but it does sound interesting. Horse in the House is still on my TBR list. I actually don't have a Puffin copy - SusanB pointed out a very nice hardcover with dust jacket going for a reasonable price on eBay, which I promptly snagged. Sounds like we had similar upbringings - my Dad was very keen on war movies too. There are some I think I probably know by heart. I agree that Dinah isn't a traditional pony story, but I think that's one of the things that makes it so good. Like you, Ride a Wild Pony is on my find it list! Chris, your post sent me scurrying to the shelves bent on a re-read, but I don't have a copy, of any description whatsoever. Mind you, I did find his Marvellous Mongolian, which I've never actually read, so it's not all bad! But inspired by you, I will hunt down a copy of Ride a Wild Pony. Thank you Barbara! Lovely to see you here. I'm really glad you enjoyed the piece. I'm not a very frequent blogger these days, so it shouldn't take you too long to catch up!